You may have noticed that it’s been awfully quiet around here lately. The truth is that I’ve been playing less WildStar. I resubbed to WoW because that is where a large number of my friends went. And then I spent the last month agonizing over that decision and hating myself and being annoyed and surly, even if I wasn’t always sure why I felt that way. Hopefully getting it out of my system in blog form will be cathartic for me and maybe either eye-opening for some folks or reassuring for others who might be going through a similar situation. These games we love are only at their best when their virtual worlds are populated. While sometimes we might fantasize about playing a MMO completely solo, the truth is they just work better and feel more alive with bustling economies and people around to join in the fun. Since for most of us our free time and often our money are limiting resources, there’s not a lot of room for multiple time-consuming MMOs in our lives. There’s some room for multiple MMOs to exist in the market, but lots of discussion gets pinned on “WoW-killers” or “Next Great Thing” and doesn’t leave a lot of room for individual people to enjoy and be vocal about many games at once. Especially in the case of WildStar, which I’ve been an advocate for from the pre-launch hype through the highs and lows of launch and through the population decline and server merges, it feels like even admitting I also play WoW is some betrayal. That giving subscription dollars and my free time to both is somehow admitting the defeat of WildStar or kicking it while it is down. WildStar still seems to me to have plenty of happy players making it into a living world, but I’m sure that Carbine would be happier to see subscription numbers increasing. Since I want the game to succeed, I feel like a jerk for enjoying multiple games, instead of advocating for the one I like best. So creepy. And pretty. Pretty creepy. World and Lore – I love sci-fi, I like this world, and I like being a part of the story as it develops. I absolutely can not wait to see what happens with Drusera and what other worlds we might visit next! Art and Visuals – This game is beautiful. Every time I log in I can’t stop taking screenshots, or just running around my house looking at the sky. Music – My favorite MMO soundtrack hands-down, and perhaps second only to Bastion as favorite video game music period. 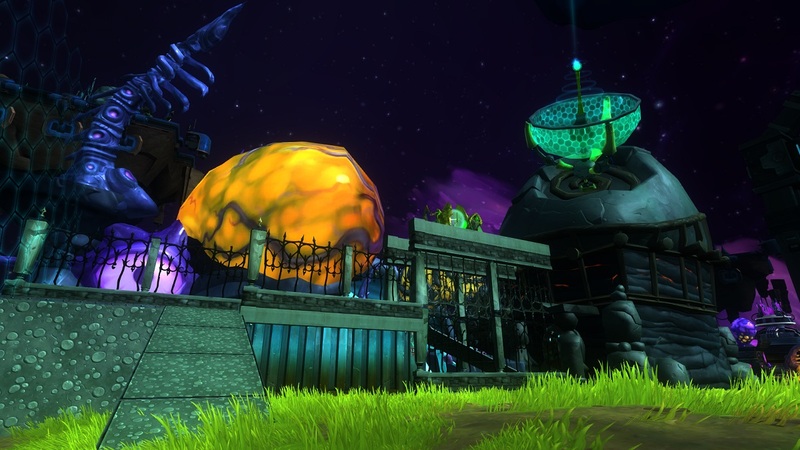 Like so much of WildStar for me, it wasn’t what I expected at all, and I love it! Combat – The telegraphs and active combat do have a learning curve, but after you get used to it everything else seems incredibly boring by comparison. Healing – Healing in WS is unlike any other MMO I’ve played, feels more like a natural extension of the combat instead of its own minigame. Customizability – Character appearance, costumes, mounts, paths, the Limited Action Set, there’s just tons of options to really make your character your own. Housing – In its own category from customization because it could be a whole game in itself. Any of you who’ve read this blog from the beginning know that it was housing which really sealed the deal for me with WildStar even though I hadn’t cared much for it in other games. Zero-G Hoverboarding – ‘Nuff said. Ease of Access – Within a week or two of returning after a long absence I was able to catch up with my guild and start raiding. WoW is king of low-barrier-to-entry, for good or ill. Personal History – It has been around 8 years since I first step foot on Azeroth, and that history is baked into my characters, and the lens through which I view that world. I also have a stable of alts ready to tackle pretty much any content I would like to do. Time-appropriate Activities – WoW has so much content of different types that it is always easy to find something to do that feels like progress, even if it is just refreshing garrison missions. Raids and dungeons take appropriate amounts of time, varying with their difficulty. Content – There’s 10 years worth of stuff to do. Friends – I’ve made a lot of friends through WildStar, but the truth is most of my friends end up pulled back into WoW’s gravity well. This is really the biggest factor, and also the one that makes me wish there was some secret to convincing everyone to love WildStar as much as I do. Given all those things to like about both games, what do I actually end up doing with my time? Do I spend time in WildStar enjoying the active combat, and focus on the accessible group content in WoW? Nope. 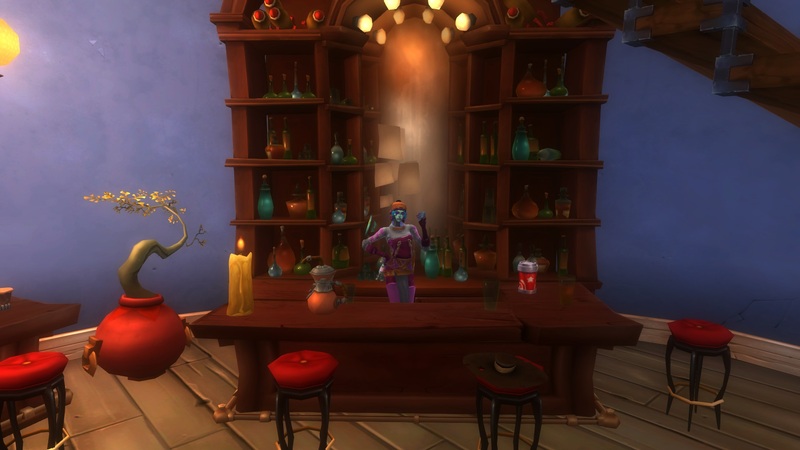 In WildStar lately I just run around my house, sometimes doing my mini-instance and fussing with my decor. In WoW, outside of 4 hours of raid time per week I just end up sitting in my garrisons on my herd of alts, updating missions and fussing over follower gear. I never seem to feel like I have enough time to spend in WildStar to get over my inertia and go out into the world to do things. Meanwhile I feel like if I’m not constantly micromanaging my followers in WoW then I’m missing out on some theoretical benefit. The net result is that my MMO time lately feels incredibly unproductive. I get down on myself for not spending enough time in the game I like better, but when I do play WildStar I miss my friends or just don’t have the energy after a long day to engage with some of the content I enjoy. The kicker is my love of raiding. I can raid LFR, normal, or hard mode in WoW after minimal spin-up time, but after playing WildStar since launch I am still not raid attuned, nor do I have a group of people I could even raid with. Even if I got over those hurdles, I get the impression that raiding in WildStar would probably require a lot more than 4 hours per week of effort. In fact if I could find a raiding guild in WildStar that would help get me up to speed, then I’d definitely have to leave WoW and those friends behind, which fills me with guilt and sadness. In the end I certainly won’t be leaving WildStar anytime soon, but I don’t know what the future holds for WoW for me or what my play time will look like in the coming months. I know some folks manage to play multiple MMOs by scheduling separate days for each one, so maybe that’s something that would work for me. Do any of you play multiple MMOs with success? What are your secrets to making it work?